When they take on tile projects, one of the first questions people ask is whether they need a manual tile cutter, a wet saw or both. Because most tile projects eventually involve some cutting you will need one or the other, but probably not both. If all you only have straight cuts, a manual scoring tool will do the job if you get a good quality one. Line up the cut and run the scoring wheel over it a few times, and then firmly press down to snap the tile cleanly. With a little practice, you can make great cuts in the area where you’re working. 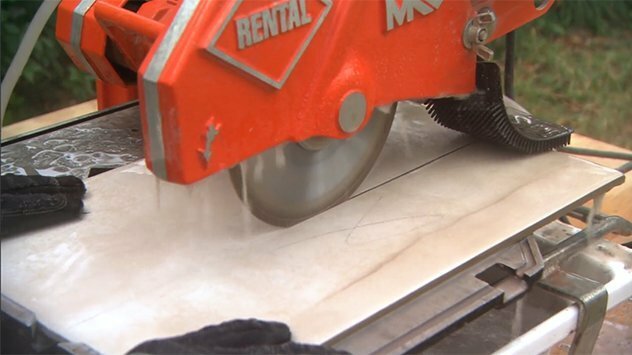 For more complex cuts, like inside corners or U-shaped cuts, you’ll need to rent a wet saw. This tool uses a diamond-tipped blade, which is constantly being sprayed by a stream of water to keep it cool as it cuts. That spray can get a little messy, so this kind of cutting is best done outside. It makes quick work of most cuts, but it’s important not rush the tiles through the saw. Take your time, and make clean cuts.